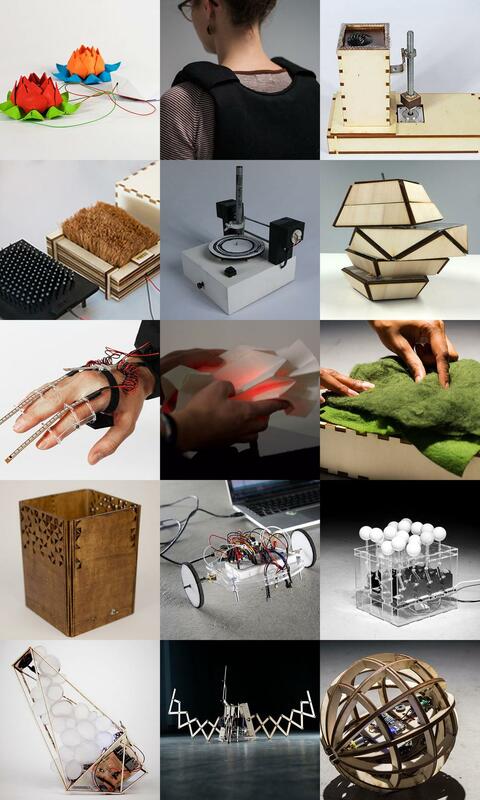 The creators and their objects: Anaïs Gautier "Soundflowers", Armanda Weibel "The Vest", Elio Haas "Ferrofluid Fountain", Fanny Schweizer "Brush", Gabriel Bach "Vinel", Ilaria Stendahl "DoDee", Jannic Mascello "ExoGlove", Lea Panzer "Circuit-Tessellation", Lisa Heierli "eLandscape", Nadja Müller "IN-PUT", Robine Joehr "Wheel-E", Sandro Poli "Surfaces Visualizer", Simon Häusler "Breath", Simon Schwarz "Scissomat", Thomas Gutruf "sPhere". Some objects utilize simple mechanisms (a bending sensor covered in a brush) while others harness more complex systems (an adjustable magnet influencing ferrofluid). However, all of the projects have been about understanding a certain mechanism and learning how to leverage it. At the end all of it had to be wrapped in an object that is power independent and can communicate wirelessly. Later, in a exhibition a patcher device coupled to a router application running on a computer, would let the visitors whimsically connect the objects with each other. 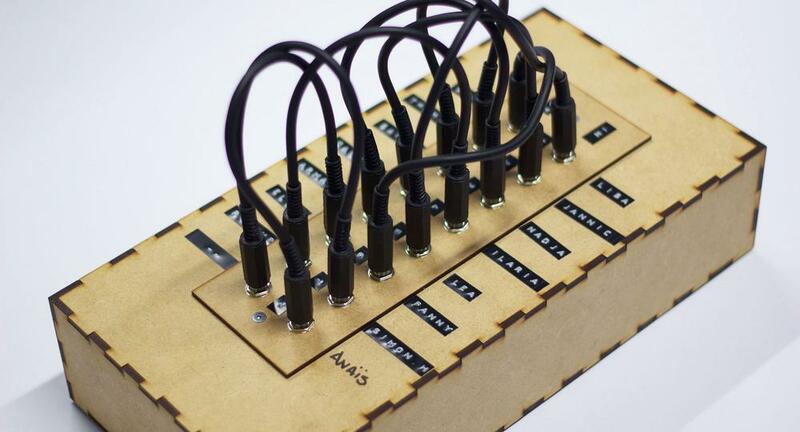 This allows to combine the various inputs with the various outputs and seek for interesting and new combinations. All in all, the course was well perceived by the students and the final exhibition has drawn many colleagues to join and interact with the variety of combinations. 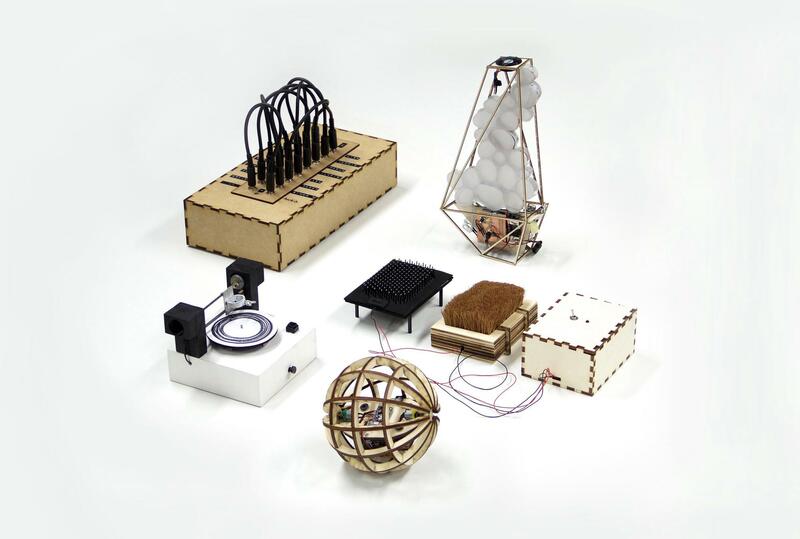 The Physical Computing course was led by Moritz Kemper and Joël Gähwiler and conducted in the fall semester 2015 with fifteen 3rd semester interaction design students.